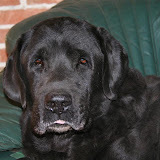 Unfortunatly, during the years, some of our labradors have left us to go over the rainbow, but they stay forever in our hearts. forever all presents in our life. Thanks for all the joy you gave us during your life.